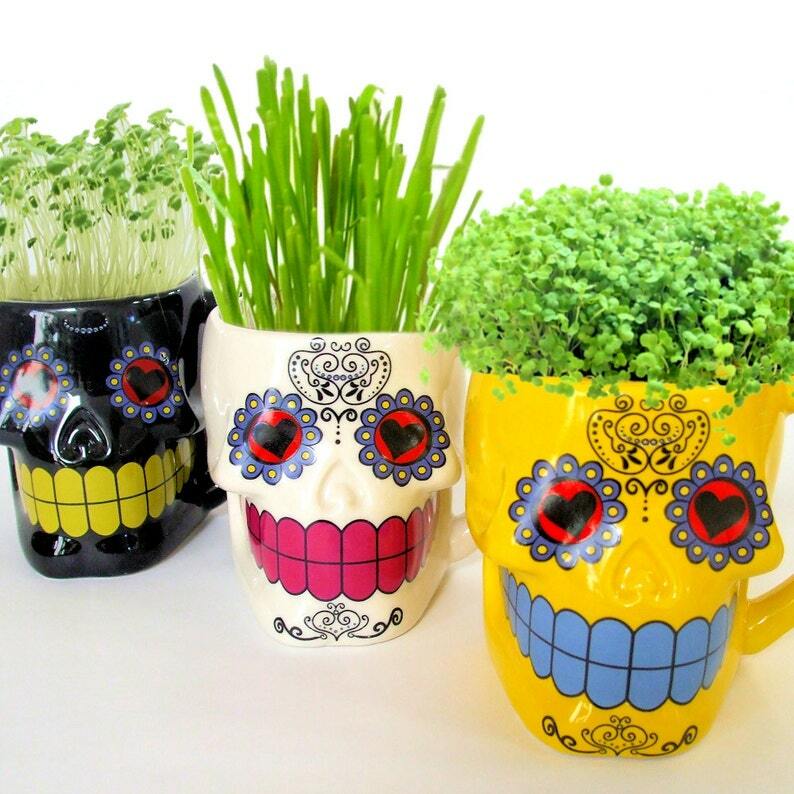 These brightly colored Dia de los Muertos sugar skulls (re-purposed ceramic coffee or tea mugs) make the cutest DIY microgreens planters ever! Just add water and sunshine to my kit seeds & soil blend, and within a week or so, you'll be harvesting your own super-fresh and nutritious microgreens. I found these happy grinning mug / planters in three colors, all three are back in stock, yay! The back of each mug has a fanciful heart embellishment, as you can see in the last photo. Each 12-ounce glazed ceramic mug is 3-1/2 inches tall and 3-1/4 inches wide (not counting the handle), perfect to perch on a windowsill or kitchen counter. Should you decide to use them for beverages, rest assured they are food safe and will survive the dishwasher on the top rack. This listing is for one mug, but you may certainly choose two or more for a really great display, and save on combined shipping too! 1. One Day of the Dead mug in the color you choose. Pick your color in the pull-down list above, or enter in Notes to Seller. 2. 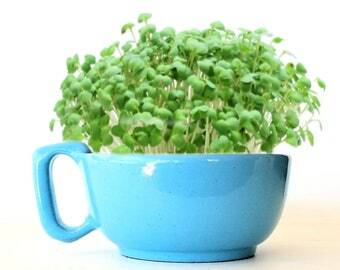 USDA certified organic, non-GMO seeds produced especially for growing as microgreens, enough to grow 2 crops in the mug. You can grow your Day of the Dead garden indoors in a sunny windowsill, or, weather permitting, outdoors in a sheltered spot. Please note that I do *not* ship the live plants shown in the photos. They're too delicate! 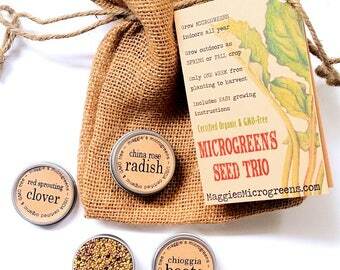 I ship the seeds and materials listed above as a DIY microgreens kit. > To Canada, I ship via USPS First Class International, which means delivery within 10 to 14 business days. > Sorry, I can't ship seeds or soil to countries outside the US and Canada, due to international restrictions on agricultural products. I can, however, ship *just the planter* anywhere in the world, and you can locally source your seeds and soil. Drop me a line for a custom planter-only listing. Arrived fast! Bought as Christmas gift. Arrived quickly. Bought as Christmas gift. GREAT communication with this seller, very patient and took the time to answer all my questions and did what she had to do to make sure I was satisfied. Definitely recommend and will order from her again.